There is a vast amount of crowing in the media about Venezuela’s hyperinflation crisis – not because of the genuine suffering of millions of Venezuelans but as a handy stick to beat the left with. I lived in Venezuela in 1995-96, two years before Hugo Chávez took power. At the time, inflation was 100 percent [the IMF estimates the 2018 inflation rate will hit 1,000,000 percent] and people rushed to the shops with their wages each month to beat the monthly price rises, clearing the shelves of essential goods. Venezuela is not new to economic crisis. 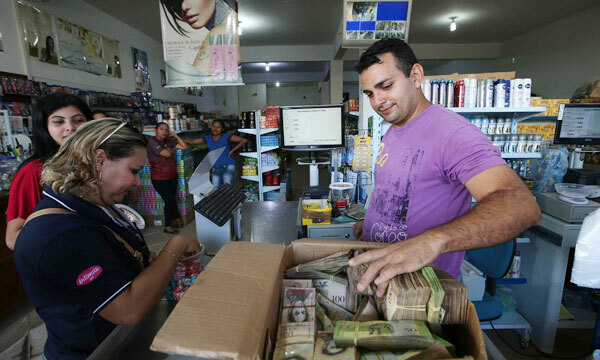 A man counts a bundle of bolivares, the currency of Venezuela. Up to 3,000 people were killed, many buried in mass graves. Several years after Chávez’s 1998 election, the opposition launched a devastating business strike. In response, the government brought in currency controls to manage a rapidly declining bolivar. While oil prices were high, the problems of government-subsidised goods being sold in Colombia in a massive cross-border trade and the illegal sale of dollars were masked, but, with the collapse of oil prices in 2014, the problems could no longer be hidden. The Venezuela crisis is not unique. Other states have faced similar crises. Iran and Iraq, both oil rent states, have faced similar crises in recent years, both under variations of neo-liberal policies. In Iraq’s case, Islamic State was one of the beneficiaries. Venezuela’s government faced attacks from early on, attacks that have rarely let up, including US sanctions targeting essential imports including medicine and food since 2016. That doesn’t absolve the government of significant responsibility for the current crisis. Maduro does not want to adopt the standard IMF policy of dollarisation to get around the problem that the bolivar is near worthless, but, if he can’t find a way to restore confidence in the economy and its currency, the dollar will effectively become Venezuela’s currency anyway. The recent currency conversion – which sees five zeros lopped off the end of every bolivar note – is an attempt to avoid that outcome. Of course, when millions flee poverty and violence under US-backed governments, as they have done for years in Latin America, that’s never the fault of capitalism.